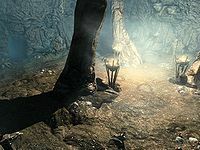 Pinemoon Cave is a small cave located to the northwest of Dragon Bridge and east of Volskygge. It is inhabited by vampires and wolves. It contains only one interior zone: Pinemoon Cave. In front of the entrance is a small camping site with an extinguished campfire and several sawn logs arranged for sitting on around the extinguished campfire. Nearby there is also a wood chopping block and three white cap mushrooms are growing around the entrance to the cave. You enter into a short tunnel lit by a lantern atop a barrel. The tunnel opens out into the first of two cavern rooms, where you will encounter two leveled wolves. There are many rock pillars in this first room, which is brightly lit by three braziers on stands. Around this chamber are several deer skulls mounted upon posts. There is a small tunnel opposite you upon entering the chamber. It takes a couple of turns before opening out into the main area containing two vampires and one master vampire. There is a vampire standing near where you enter on a raised section above the main part of the room, with an earthern ramp leading down in front of where you enter. The vampire will have their back to you unless they have been alerted to your presence. The master vampire is visible at the back of the room wandering near a podium on another raised area. The third vampire is wandering near some wooden benches arranged in front of the podium. Below the raised section via which you enter is a table with several barrels on either side containing foodstuffs and ingredients, as well as two sets of shelves farther to the right. These hold eight bottles of alto wine, four bottles of wine, and a random potion of stamina. Against the southern wall of the room is another table with a Nord corpse on top that may be reanimated during the fight. There are more barrels either side of the table, and a table to the right with another bottle of alto wine on top. 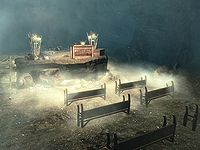 On the raised area with the podium are two lit braziers on stands, one on either side of the podium, and a novice-locked chest. A wooden and an earthen ramp lead up to this area. There is a short tunnel leading from the western wall of the room to a bedroom, hosting an unowned double bed, an empty cage, and an unlocked large chest. You can find a copy of the Illusion skill book Incident at Necrom on a small table next to the cage. The cave contains the highest concentration of fly amanita in the game. A total of 66 fly amanita mushrooms can be found growing throughout the cave's chambers and its passageways. 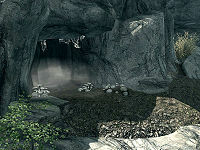 The cave is contrasted between brightly lit areas and deep shadows allowing for easy sneaking.